Stainless Steel Tumbling Media Pins - 0.047'' Diameter, 0.255'' Length (100 lb Pack) by guntap at In The National Interest. MPN: SSP100. Hurry! Limited time offer. Offer valid only while supplies last. Stainless Steel Tumbling Pins 100 pound package (shipped in two boxes) by guntap is the best tumbling media to clean, polish, and deburr metals. 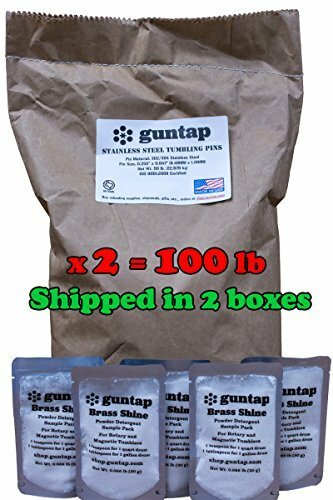 Stainless Steel Tumbling Pins 100 pound package (shipped in two boxes) by guntap is the best tumbling media to clean, polish, and deburr metals. Ideal for handloaders who use a rotary tumbler or magnetic tumbler to clean their brass cartridges. The media can be used with brass cases with any primer pocket or flash hole size without fear of having stuck pins. Bonus: Receive ten 30 gram (0.066 pound) sample packs of Brass Shine detergent to use with your stainless pins. No need to create your own recipe using dish detergent and a water softener. Brass Shine works with all type of water. Just add 1 tsp for a 1 quart drum or 1 tbsp for a 1 gallon drum and you're ready to go. This media can be used on any metal that has a hardness of less than or equal to the 302 304 stainless steel alloy used to manufacture these tumbling pins. They are also magnetized by the manufacturer to allow for easy pickup and separation with a strong magnet, such as a ceramic or rare earth magnet. The dimensions of these pins, 0.047" in diameter by 0.255" in length, were specifically designed so they would not become jammed in the flash hole or primer pocket of brass cartridges. The smaller 0.041" size pins have a tendency to get jammed sideways in the primer pocket. A 1 gallon (4L) rotary tumbler drum requires approximately 5 pounds of stainless steel tumbling media in order to quickly and efficiently clean brass cases or metal parts. A 1 quart (1L) rotary tumbler drum requires approximately 1 pound of stainless steel tumbling pins. If you have any questions about this product by guntap, contact us by completing and submitting the form below. If you are looking for a specif part number, please include it with your message.